The SVC-RS15 PVC cap is designed for use on 1-1/2″ sump pump discharge lines, drainage pipes and other plumbing applications that require screened vent protection. The 316 stainless steel screen used in the SVC-RS15 provides adequate filtration of ordinary lawn debris while also keeping animals out of critical vents. With the included fasteners, the SVC-RS15 may be mechanically fastened, cemented welded or installed with a slip but snug fit to cover an existing 1-1/2″ PVC pipe termination. 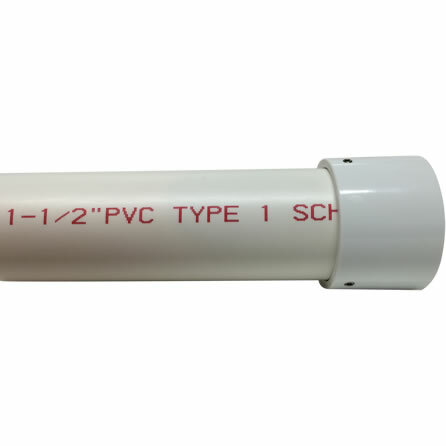 Protecting PVC sump pump discharge pipes from animals and debris is easily accomplished with the SVC-RS15 screened PVC vent cap. The patent pending SVC-RS15 consists of a strong PVC housing and a high quality 316 stainless steel screen to provide a long and reliable service life. With a tapered 1.910″ inside diameter housing, the SVC-RS15 may be installed over an existing standard 1-1/2″ PVC pipe that measures 1.900″ on the outside diameter. This vent cap allows the installer to attach the SVC-RS15 with a slip fit, permanently with a cement weld or with the included stainless steel fasteners. The screened SVC-RS15 PVC vent cap utilizes a 76% open area stainless steel screen with openings that measure .218″ x .218″. Though the screen openings are large enough to provide adequate flow of air, gas and water, animals and larger debris will be unable to access a submersible sump pump discharge line. The SVC-RS15 is often used with 1/3, 1/2 and 3/4 horsepower submersible sump pumps that have a 1-1/2″ NPT discharge port and pipes, though this vent cap will also work with 1″ NPT discharge ports that have been adapted to a 1-1/2″ PVC pipe outlet. Common sump pumps using the SVC-RS15 include Flotec, Liberty Pumps, Simer, Wayne and Zoeller models. If a 2″ NPT discharge vent cap is needed, please use our SVC-RS2. When the SVC-RS15 is used to protect a sump pump discharge/outlet, it is important that the sump pit/basin is free of debris that could potentially collect on the inside of the screen. A pre-filter may be necessary in applications where sump pumps may discharge solid materials. Because of the potential of freezing, the SVC-RS15 is not recommended for use on sump pump discharge pipes or in drainage applications when temperatures drop below freezing. Though the SVC-RS15 is often used by those with submersible and backup sump pumps, this screened vent cap may be used in many other applications where air, gas and liquids must travel through unobstructed PVC pipes. 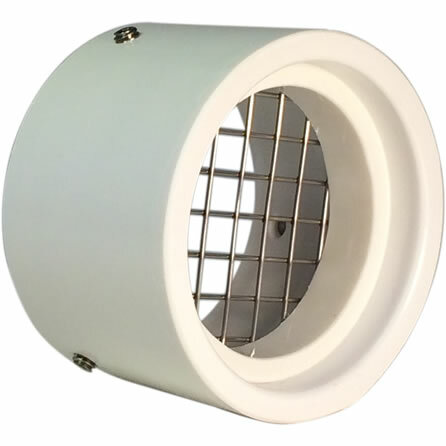 In applications where protection from insects is also needed, please see our 1-1/2″ SVC-IS15 insect vent cap. Please note each SVC-RS15 we sell includes the screened vent cap, stainless steel fasteners, installation instructions and a free hex wrench.